Upon leaving Gourmet Haus Staudt, it seems that Powell left the top-secret device on his bar stool. According to Gizmodo this is how the scene played out. The person who eventually ended up with the lost iPhone was sitting next to Powell. He was drinking with a friend too. He noticed Powell on the stool next to him but didn’t think twice about him at the time. Not until Powell had already left the bar, and a random really drunk guy—who’d been sitting on the other side of Powell—returned from the bathroom to his own stool. The Random Really Drunk Guy pointed at the iPhone sitting on the stool, the precious prototype left by the young Apple engineer. “Hey man, is that your iPhone?” asked Random Really Drunk Guy. “Ooooh, I guess it’s your friend’s then,” referring to a friend who at the time was in the bathroom. “Here, take it,” said the Random Really Drunk Guy, handing it to him. “You don’t want to lose it.” After that, the Random Really Drunk Guy also left the bar. The next day the anonymous finder of the 4G iPhone finds that the device has been remotely wiped (I’m assuming via MobileMe). After further review he discovers that the 3GS disguised iPhone is actually something much different. 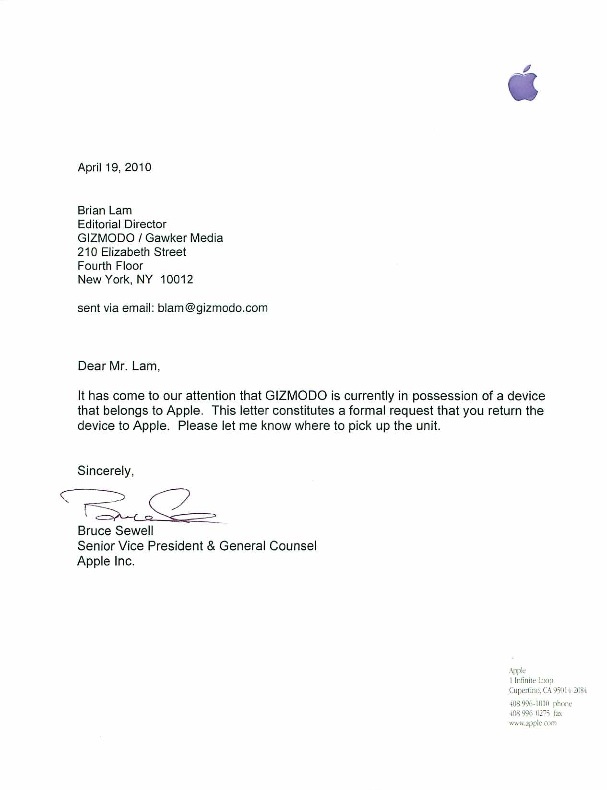 He tried to contact Apple to no avail… later Gizmodo purchases the device from him for $5,000. Read the full story on Gizmodo. Now, being a skeptic by nature, I have to ask myself… is this the case of a little too much German beer or is it the case of a smooth leak. Honestly, Apple is usually pretty tight-lipped (ok, extremely overbearingly protective) of it’s unreleased products so I’m left wondering which case I believe. On a side note: have a redesign! everyone has an opinion, and mine is that this is an awesome design, so far away from the already boring and very weird rounded back, the aluminum gives it a nice touch and sturdiness, to me overall nice industrial design, and regarding the having to wait for them to unveil it you are right, it makes you ant it more. lol. I completely agree with you. I really hope it’s the real thing because I think this is a fantastic redesign. The iPhone’s current design is feeling a little tired. This revamp is stylish and practical. I love it! The apple event is what its all about. I am sad of the fact that we see it now with no shazam. I do love the design though. I am still looking forward to the event though due to other things I would like to know. ie. VERIZON IPHONE!!! one can only hope. I agree, and speaking Of hope I can only hope that the new iphone is quadband so I can use it with T mobile because I still refuse to give a penny to ATT, also now that i see the desing and love it, I woyld like that they made revisions to minor things on the software that annoyes me baddly like not been able to see at calls history while on a call, not been able to reorganize different phone numbers on a contact or simply erase single calls on the log, this tiny details makes me miss my ancient nokias sometines, lol, by the way those shiny widgets that allow u to have certain info at a glance that other os have makes the iphone UI look outdated. I don’t really care for the new design. I hope this isn’t the final product. But even still I’m a fanboy and will be getting one and jailbreaking it. If they were able to wipe it via MobileMe, why didn’t they locate it using Find My iPhone. Between that and them going back to a flat back over the more comfortable slightly curved, I’m still a skeptic. Hey when do you think Apple is going to announced it ¿? im asking cause i thought there was not going to be a new iphone for 2010 , i thought apple was really bussy with the ipad and that maybe there was only going to be a firmware update (4.0).. I wanted to buy my 3GS 32gb version this week , now im not sure , because if there is a new iphone coming i better wait a little bit more.. what do you think ? I’m wondering the same thing. Apple better not be screwing us around for a long time with the release of this 4G. I want to upgrade to the 3GS, but now that I’ve seen this, I may as well hold off and wait for the 4G. I’ve been seriously considering switching smart phones altogether because Apple seems to be behind the rest of the smart phone world with these great new ones out now. pretty convenient that they can’t get to the processor and other key components inside the phone…that would prove it once and for all.